Hanson Marketing offers global marketing and sales leadership in a variety of emerging and high-growth market sectors. Hanson Marketing offers expertise in developing premier, global channel partnerships that embrace new technologies and aggressively reach early adopter customers. Working with our clients, we form teams of multi-national marketing specialists, trainers, vendors, and channel managers. By linking early-stage technology products with motivated resellers, Hanson Marketing finds customers in search of progressive solutions. Successful channel partners convey your reputation for integrity and appreciate your sense of urgency, every day. Make sure they’re innovative, dedicated, and creative ... just like you. 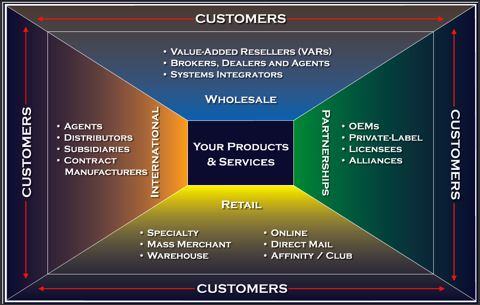 Hanson Marketing recruits, vets, trains, and mentors multi-tiered global partnerships -- OEMs, VARs, System Integrators, Brokers, Distributors, Mass Merchants, and Specialty Retailers. “Brands belong to customers, not companies.” Leading brand theorists posit that social networking phenomena have turned the tables on how brands are conceived and launched towards their intended target customers.